The Wood of Morois occupies a special place in the landscape of Celtic mythology. It is where two legendary lovers, Tristan and Iseult, took refuge to escape the vengeance of King Mark of Cornwall. A wild, primeval place but, for them, a place of sanctuary. Most of the tunes on this CD are drawn from my stage show: The Flame of Love: the Romance of Tristan and Iseult. They were chosen to evoke the many emotions and colors of this marvelous medieval legend. They spring from Celtic lands which Tristan and Iseult knew well, particularly Brittany, where their story ends. 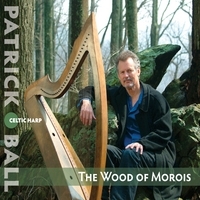 The Celtic harp on this recording was made by Jay Witcher of Houlton, ME. With its 32 strings of solid brass and its body of soft maple, it is a superb recreation of the harps that were played in Ireland at least a thousand years ago. Tristan himself was a renowned harper. If you had lived in his time and place and felt the need to escape from this world, this is what you might have heard if you took refuge in The Wood of Morois.